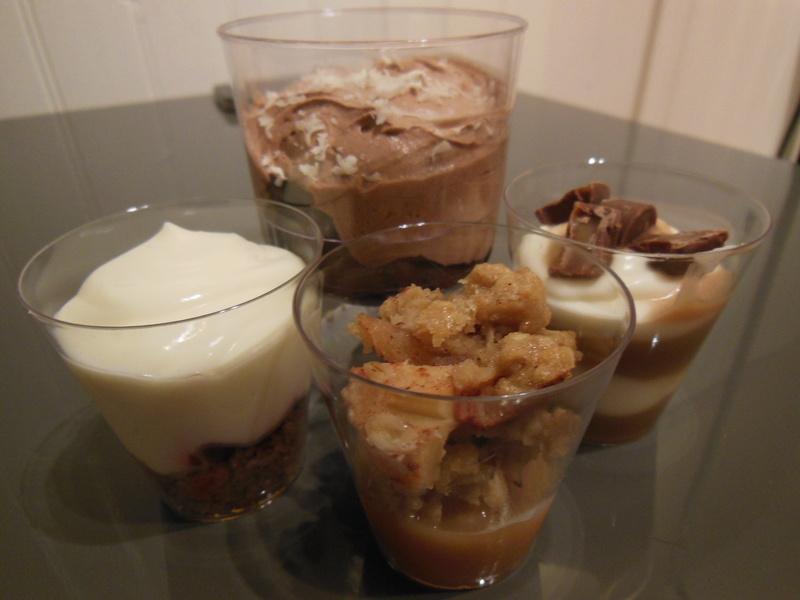 Clockwise starting from the top: Chocolate Mousse, Salted Caramel, Apple Crumble, Strawberry Cheesecake. The fun part is finding a very basic foundation for a dessert and seeing what variations will come of it. For example, the Strawberry Cheesecake and Salted Caramel used the same cheesecake filling (recipe below). Beat cream cheese until soft. Add whipping cream and beat until mixture becomes thick. Add sugar and continue to beat until stiff. Combine graham crumbs, brown sugar and butter. Spoon roughly a teaspoon into the shot glasses. Sprinkle some strawberry pieces over crumbs and then top with cheesecake filling. Layer your ingredients starting with the caramel sauce, pinch of salt, then cheesecake filling. Repeat as necessary. Cut two Mini Rolos in half and top each shot.